It was during Miss Uppadine’s Maths lessons that the stick was at its most merciless. 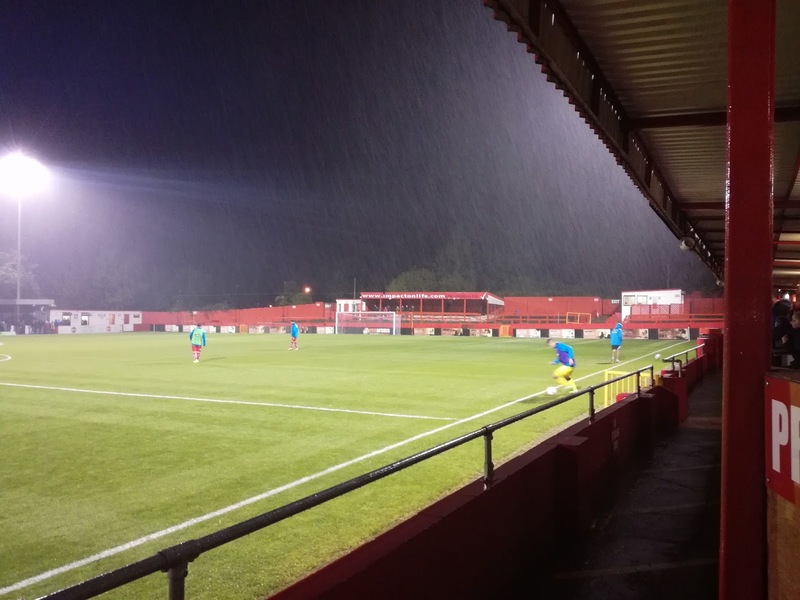 Going to school in Alfreton was an interesting experience, but that experience took on another aspect when it came to the attention of a group of Alfreton Town supporters that they had a Belper Town fan sat in the same classroom. Curiosity initially that this ‘alien’ had landed on their territory, lead to some banter, but then as we got to know each other a little bit better, the banter became more intense, to the point where, especially during the build up to games between each other, it was never ending. Of course, I was on my own and in a no win situation, I got it from all angles. I was eleven years old, a simple kid from a quiet village and the ‘townies’ had sniffed blood! In all fairness though, after Belper won the Northern Counties East League in 1984-85, a season during which the Nailers beat Alfreton 2-0 very late in the campaign to virtually seal the championship, we didn’t have much to shout about, apart from a very famous 5-0 victory during the year Alfreton won the title themselves and with it promotion to the Northern Premier League. I didn’t really know the Alfreton contingent in our Championship year, but I certainly knew them thereafter, and barring the 5-0, it was pretty much one way traffic. Don’t get me wrong, when we weren’t squabbling about the rivalry, we got on brilliantly because deep down we were mates, but I have to say when they did get promoted I breathed a sigh of relief that I wouldn’t have to put up with another two games against them. "You Walk Into The Tin End....."
I was wrong, I couldn’t get away from it. We then had a habit of meeting in the Derbyshire Senior Cup, where clearly we would get beaten pretty heavily, and as usual, my name would be chanted from the terraces, and it was far from complimentary. Being honest, I used to dread the games, not the game itself, that was an inevitable defeat, it was the grief I was going to cop for. Something changed though, you could argue that we grew up, but those who know us all today would argue that has never really happened. What we did do was get a little bit older, a couple of us went into Sixth Form, a couple left school, and we drifted a little bit. I went away to University, but when I returned, I was stuck with a bit of a dilemma. I’d had a Derby County season ticket in the couple of years prior to Uni, but chose not to persist with it when I got back. I watched Belper a bit, but I also used to go to Alfreton, mainly to catch up with the lads who I’d kept in touch with. Alfreton were a fine side at the time, vying for promotion, and to be fair I went through a spell of watching them home and away, but the family ties with Belper coupled with the fact we were on a great FA Vase run to the semi-finals, ultimately saw me migrate home. 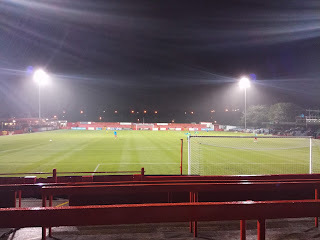 That said, watching the fantastic Alfreton side, which contained great players like John McFadzean, Matt Walsh, Steve Johnson, Phil Stafford and Paul Eshelby, along with the superb atmosphere that the fans created, stuck with me. I was to go back whenever the opportunity allowed me. 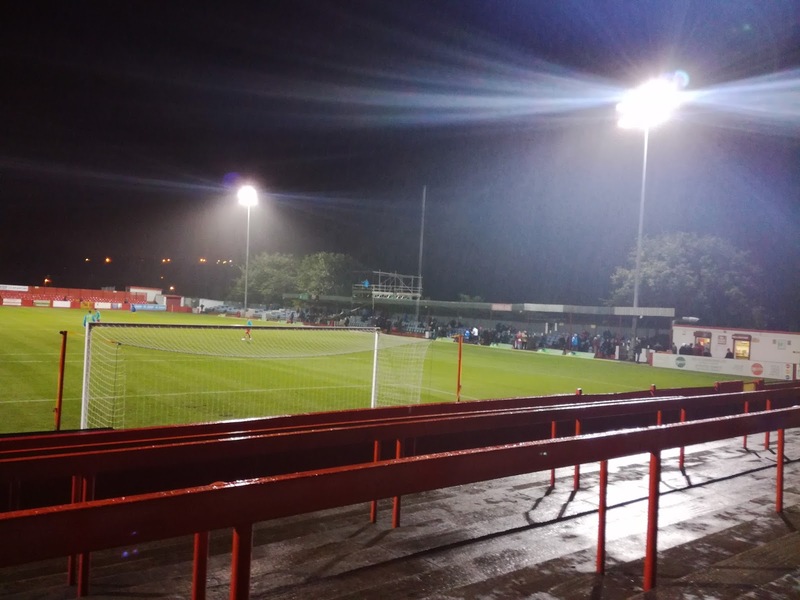 Since those days back in the mid-nineties, I get along to the Impact Arena a few times a season, and during the last twenty years or so, I’ve seen some incredible things happen at Alfreton Town. 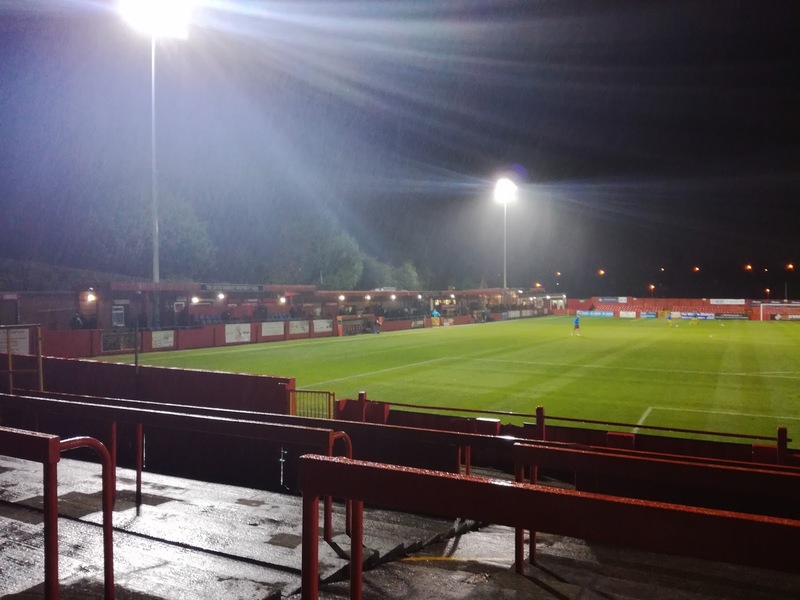 I saw Belper ultimately have a spell where they were the dominant side of the two, as Alfreton slipped down the pyramid and back into the Northern Counties East League, but then along came a man called Wayne Bradley. The rest is history, Chris Wilder who is now managing Sheffield United took them to the treble, and then a second promotion was gained into the top flight of the Northern Premier League. During that second promotion season they dicked us, and we were also a fancied side at the time, 5-1 at home, but we did manage to win the return somehow! I did cop for a little bit of flack after the 5-1 game as you would expect! 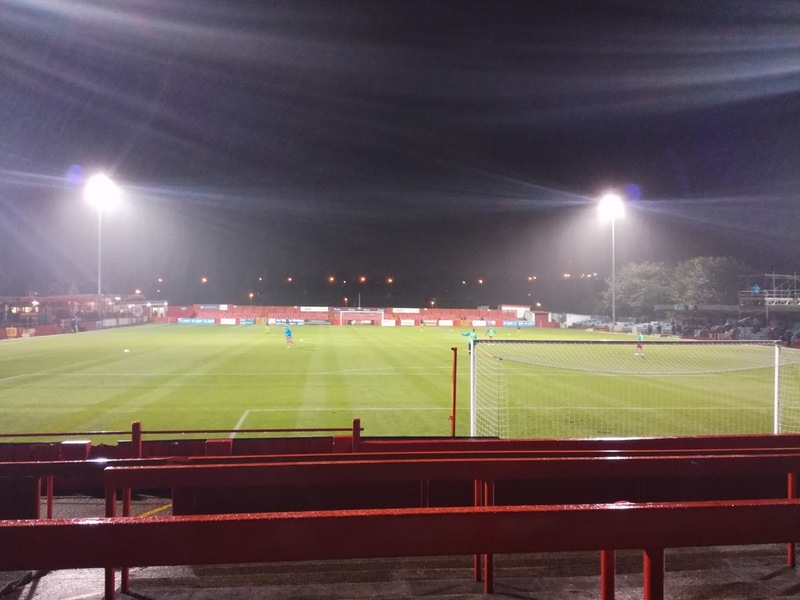 Restructuring lead to Alfreton becoming founder members of the Conference North, and I remember fondly being invited to spend the day with the Reds fans on the afternoon they won the league to seal a historic promotion to the Conference National. It felt special to just witness that moment. Alfreton are also an accomplished Cup side, myself and my Dad travelled with the massed away fans to watch them lose an FA Cup replay unluckily at then League Two outfit Macclesfield Town, while for my fortieth birthday, the lads (Mark, Lee and Ste) bought myself and my Dad tickets for the FA Cup tie with Leyton Orient, we had a superb afternoon with them. But what has also happened over the years is that both sets of fans have developed a fondness for each other. When Alfreton don’t have a game, a few of their fans come to watch us, and quite often when Belper don’t have a game, it’s not just myself that travels up the A38 to watch the Reds. We’re well into our forties now, we’ve matured with age, we love our football and we like a pint, but what we have that is most important of all is a mutual respect for each other as mates, football fans and lovers of the non-league game. It didn’t matter that we beat them in a Derbyshire Senior Cup Final a few years back, and they went on to beat us on penalties in another final two years ago. In fact when we met last season at Belper and they won 4-0 in the Cup, we spent the entire game stood together, I just wouldn’t have dare do that back in the Eighties! 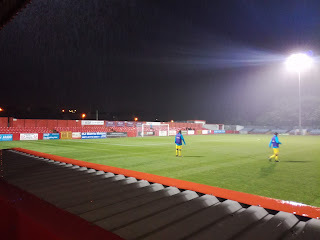 Tonight I went along for the first time this season, really looking forward to seeing a revitalised Reds side under John McDermott taking on one of the early pace setters and fancied sides in the shape of Brackley Town. I wasn’t disappointed, it was a fantastic game on what must be the best pitch anywhere around for miles. Brackley took the lead but a deft touch by Craig Westcarr onto an in swinging free kick saw Alfreton equalise. 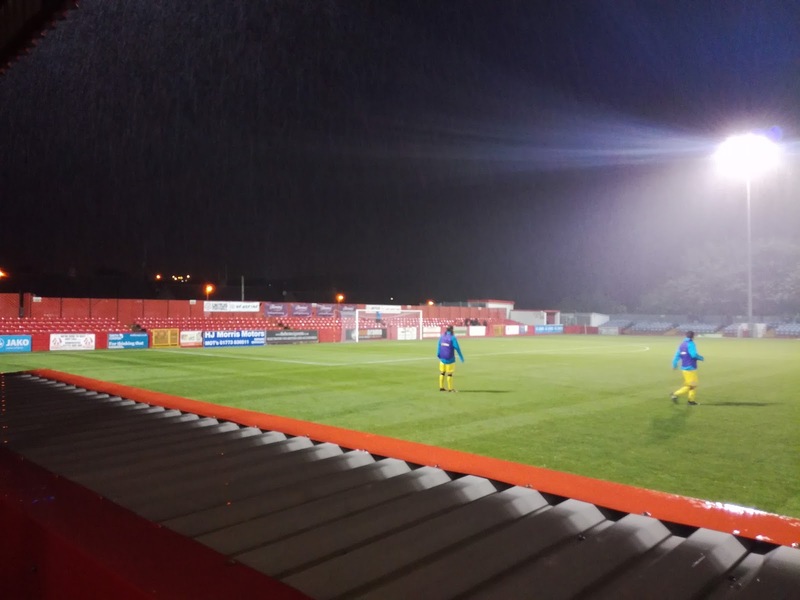 Brackley played some superb football in the second half but Alfreton defended like warriors and dug deep to earn a deserved point. The Reds have a lot to feel optimistic about this season, new investment, backed with the superb vocal support they receive home and away, could lead to a possible Play Off push, but this is such a strong league, far tougher than the one they won in 2012. The heavy rain didn’t put a dampener on proceedings, and most importantly it was a chance to catch up with the lads, and have some great banter and share some memories. I have stolen a saying that I once heard Johnny Vaughan use on 5Live, it’s “Never Let The Football Ruin The Football”, that never happens when I go to Alfreton. I could go on and talk about the time we came back from Hyde and wrapped a car door round a lamp post, I could talk about our first teenage holiday in Ingoldmells, I could talk about trips to Ireland together and missed flights, I could talk about birthdays, weddings, college parties, fancy dress costumes, run ins with the law on the way back from Congleton, beer festivals, and any number of scrapes we got into along the way. But, it was over thirty years ago now that we used to sit in Miss Uppadine’s Maths lessons, never let anyone tell you that school’s a waste of time, all that pain has been worth it in the long run.